KONGSBERG CEO Geir Håøy and Nasser Hassan Al-Naimi, Managing Director Barzan Holdings, signing the agreement in Doha, Qatar. Kongsberg Group has entered into a major contract with Qatar on long-term technology development programs in the field of defense, maritime industry and digitization. The tiny oil- and gas-rich Gulf state of Qatar has been recently cut off by some of its powerful Arab neighbors over its alleged support for terrorism. The country seeks new markets and opportunities amid the Gulf crisis. The contract with Qatar is the largest in Kongsberg Group’s history and the first subcontract has a value of at least NOK 15 billion. The Kongsberg Group announced the cooperation agreement in a press release today. 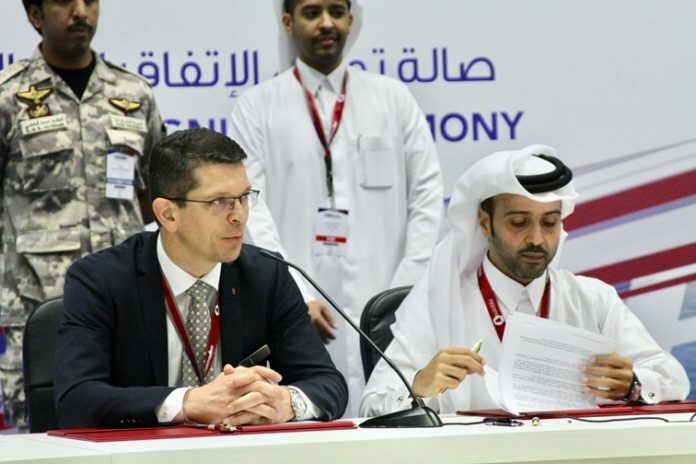 The first program in connection with the cooperation will be delivery of communications, digitalization and tower solutions for military vehicles in Qatar, a program with a potential of around NOK 15 billion over the next eight years. The program will be the largest in KONGSBERG’s history. Together with Barzan Holdings, KONGSBERG has established a new company for technology development programs. The company, BK Systems, will have its main office in Qatar Science &amp; Technology Park, and KONGSBERG holding the CEO position. The park is an innovation hub for leading international industry and universities. The company announces that the value of the contract is approximately 15 billion NOK and 15.000 Norwegian man-labour years and more than 170 small and medium sized sub-suppliers will be involved in the programme over the next eight years. – There are many possibilities in the future. The first program is a vehicle program for military vehicles in Qatar. It has a great potential, communications director at the Kongsberg Group, Ronny Lie says to NRK.